« What’s a Ticker Garden? John, from Tale of the Tape, asks a very interesting question regarding the nature of sentiment during a bear market. He wonders whether high bearish sentiment is a bullish signal during both bear and bull markets. Now, be mindful that the dates for the survey and the weekly candles don’t match exactly. What I’ve done is to round ahead to the next candle/week. So for example, if the survey date is May 12th and there are two candles with start dates May 8th and May 15th, I put the “sentiment” dot on May 15th’s candle. Capisce? The result is that in some instances it may appear that sentiment was ‘off’ or ‘late’ in signalling a rally… where it wasn’t really. bearish sentiment accompanied the index’s plunge! 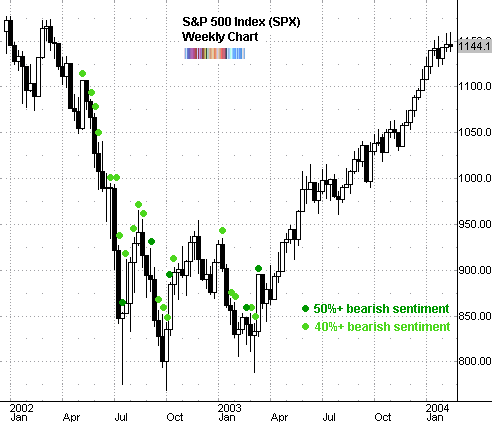 clusters of major bearish sentiment can actually be dangerous! But remember that sentiment, especially only one measure of it such as AAII, should never be used as a tell in isolation. 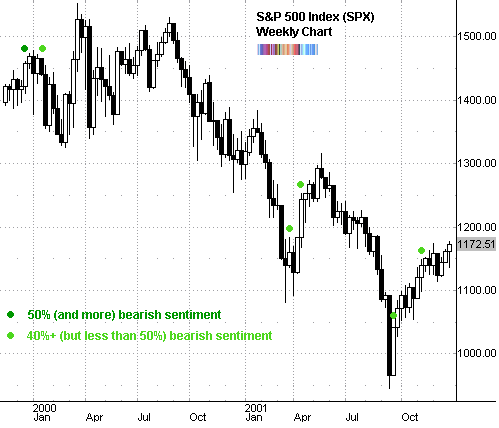 Sentiment as a contrarian measure is useful, but it must be combined with other tools to round out a picture.